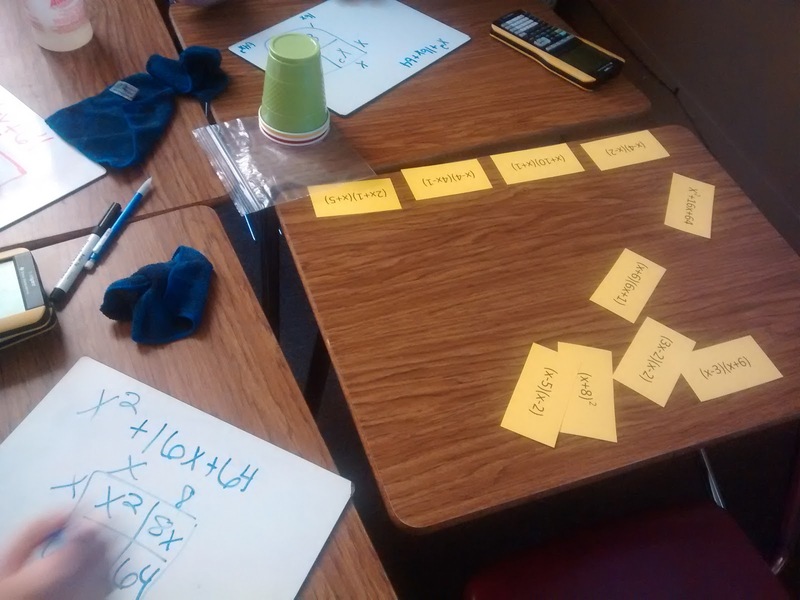 This year, we got off to a very rough start with factoring polynomials in Algebra 2. I had the brilliant idea that I would show my students how to factor using algebra tiles before we started using the box method for factoring. My students were frustrated. I was frustrated. And, it was the equivalent of throwing away a day of class time. I wouldn't even classify it as a productive struggle. So, the next day, I won their hearts back by showing them the box method. And, I made them this question stack activity to practice factoring with the box method to prepare for their factoring quiz. When I started to teach factoring four years ago, I had no clue what I was doing. I had learned to factor in high school using guess and check. Because algebra is one of my strengths, this method worked well for me. My students that first year had a ton of trouble with the check step in "guess and check" which meant they would guess right, multiply wrong, keep guessing, and never arrive at a final answer. This frustration led me to try a variety of other ways to teach factoring. I taught the airplane method. I taught students to factor by grouping and split the middle term. I taught students to slide, divide, bottoms up. My students rocked these methods, but their overall retention level was terrible. The box method isn't just a fancy trick for my students to memorize and then forget. 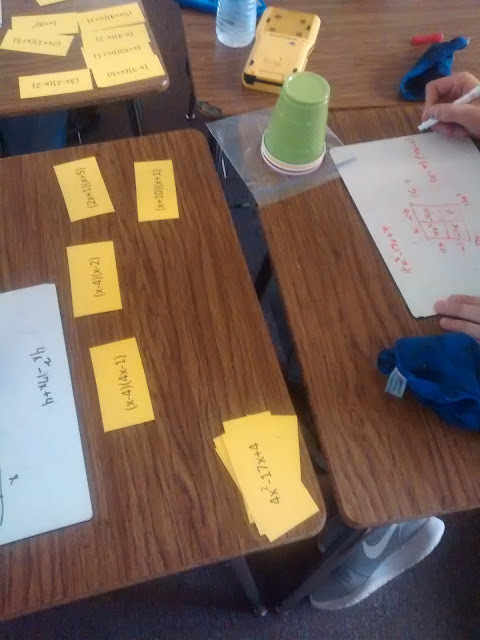 It relies on the same understanding of the area model that they have been building throughout the unit while multiplying and dividing polynomials. I tweaked the box method slightly this year, and my students have responded really positively. That's a post for another day, though. Today, I want to post the practice activity. And, you can use this activity no matter which way you teach factoring. Each group got one pre-cut sheet of cards. One side has the factored trinomial. The other side has an unfactored trinomial. They are not flash cards. The two versions on one card do not match up. They are made so that the cards form a loop of question, answer, new question, answer, new question, etc. Download link is at the bottom of the post. 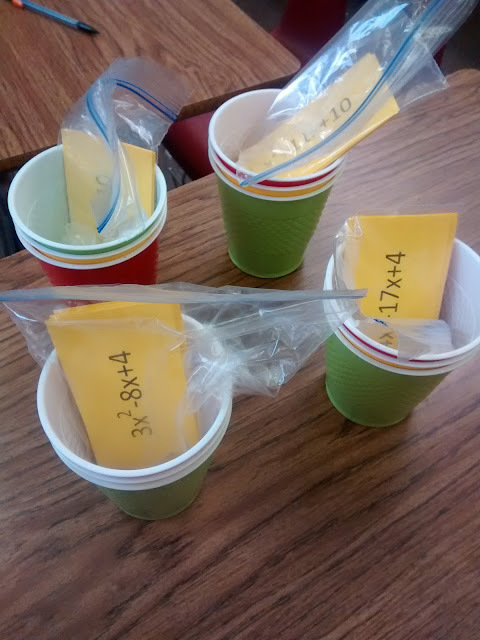 I distributed the cards to each group in their stack of red/yellow/green cups. They set out the questions on their desk with the answers facing up. Since we were using this activity to practice factoring, the answers were the factored version. You could also use this same deck to practice multiplying binomials. 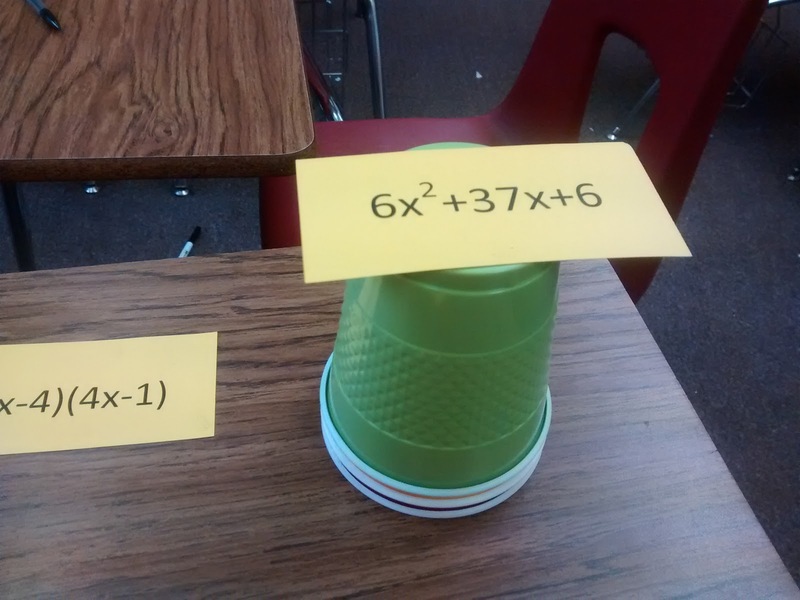 For this, students would start out with the unfactored version facing up. 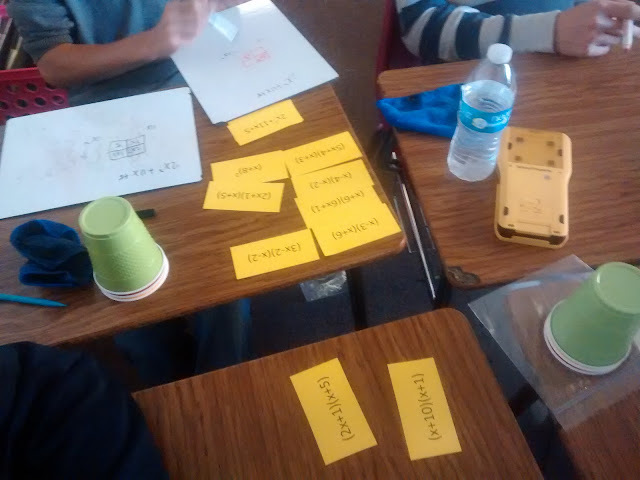 Students chose one card at random to turn upside down and begin a stack on top of their cups. They factored them on their dry erase boards or in their notebook. I let my students use their interactive notebooks on all of their quizzes, so many of my students choose to put their practice problems in their notebooks so they can reference them later. I'm finding that many of my students take better notes when they know that they get to use their notebook on their quizzes. Once they find the answer, they locate it on the desk in the answer bank. 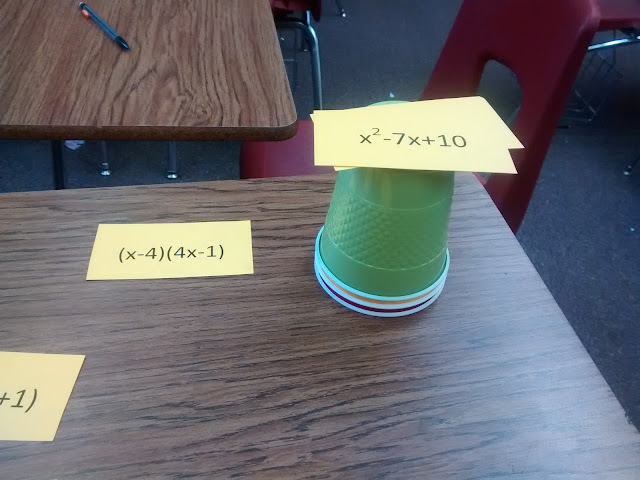 This card is turned upside down and placed on top of the cup to display the new question. 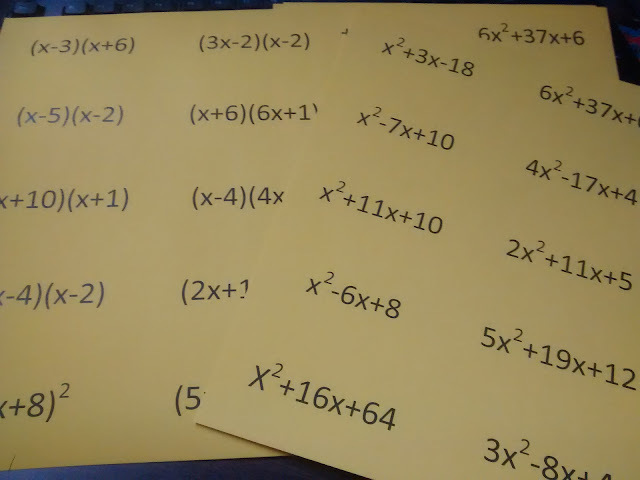 I was worried with this activity that students might just look at the answer bank and not try the factoring on their own, but this was not an issue at all. As the activity continues, the answer bank gets smaller and smaller. My favorite part of this practice structure is that it is self-checking. If a group gets an answer that isn't in the bank, they can't move on until they figure it out. Sometimes, there is a really similar answer in the bank, and they can figure out what they did wrong. Other times, they have to ask for help. That's what the red/yellow/green cups are for. Next year, I definitely want to include some problems where students need to factor out the GCF first. This was the perfect number of questions to give students practice for the first half of class and give them time to take their quiz during the last half of class. We have 52 minute periods. I'm looking forward to reading about factoring with the box method. I use the grouping/split the middle term method. But I'm always intrigued by other "non-trick" methods. It's on my list to blog about! This file can't be downloaded- when I click download nothing happens. That's happened to me the last couple tines I've tried to downloaded something from here. You are probably over your 10 GB bandwidth limit with box.com. That happened to me last month. Anyway, could you email me the file? miss.calcul8 at gmail. Please and thank you! E-mail sent! Thanks for letting me know! Really looking forward to the post on factoring using the box method. 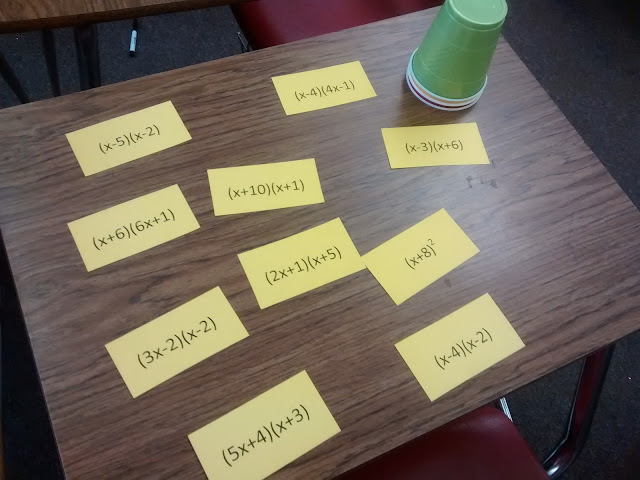 I've used the box method to teach multiplication of polynomials, and my students loved it! 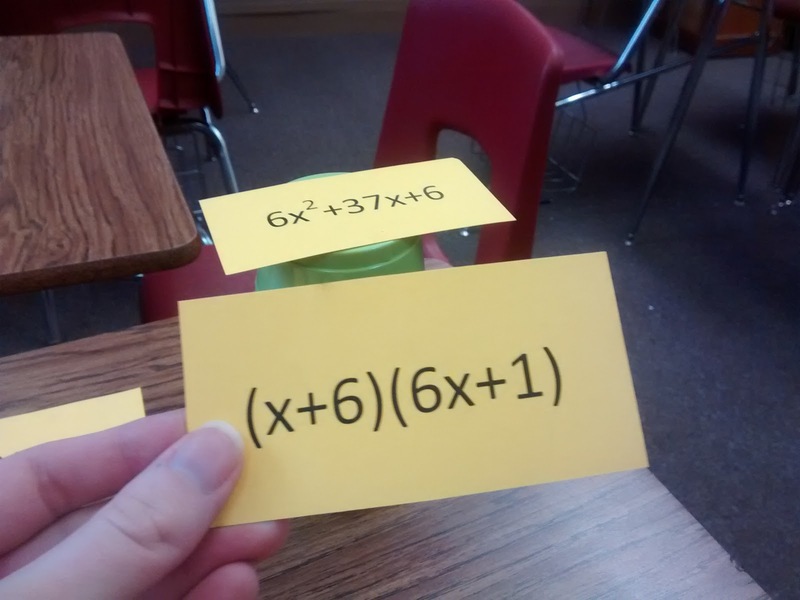 It eliminates (for the most part) the careless error of forgetting to distribute the outside term to each term inside that often happens when students (and sometimes even I) apply the distributive property. Looking forward to the next blog post!! Definitely need to work on this blog post! I'm sooooooooooo behind on blogging. I love the activity but the method still seems like a bit of a gimmick. Can the students explain why they are finding the sum or difference of the product of the first and last factor? I love the fact that it reinforces the idea of area but I wish it could do so without the "middle step of mystery". This is on my list of things I want to work on this summer! I love love love the box method! You can also use it to divide polynomials!! Best thing ever!